Open Tuesday & Thursday, plus the First Saturday of Every Month. Click here to watch local television coverage of the museum! Admission to the museum is free and we look forward to welcoming you! 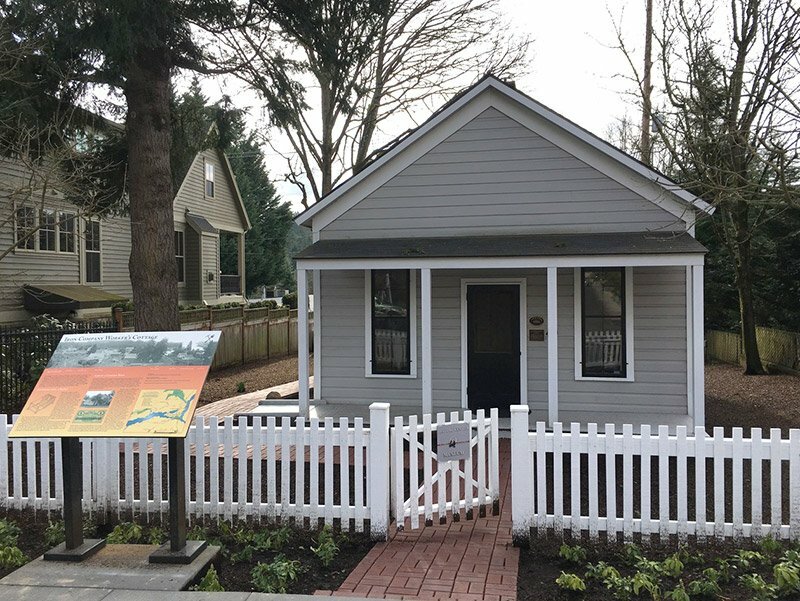 The museum is housed in Lake Oswego’s oldest house that is open to the public! It’s located at 40 Wilbur Street, Lake Oswego, OR 97034 in the Old Town Neighborhood. Museum hours are Tuesdays and Thursdays and the first Saturday of every month from 1:00 pm to 4:00 pm unless one of these regularly scheduled days falls on a holiday. It is also open by appointment for school classes and other group tours. The museum is ADA accessible. Three parking places, including one ADA space, along with bicycle parking, are accessible from the alley behind (south) of the museum. The nearest TriMet bus stops are South State and Wilbur Streets (northbound) and South State Street and Middlecrest Road (southbound). We are very happy to open the museum for group tours. Groups for whom we have given special tours include Cascade Prime Timers, City of Lake Oswego Planning Department, City of Lake Oswego Parks & Recreation, Lake Oswego Adult Community Center, The Stafford, Portland Area Teachers – Retired. 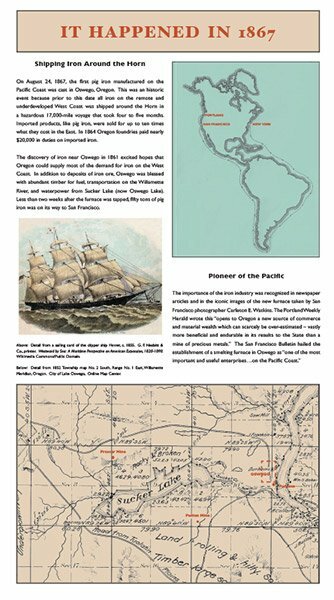 The museum’s inaugural exhibit entitled 1867–2017 Oregon’s Iron Jubilee: Celebrating the First Iron Furnace on the Pacific Coast was curated by historian Susanna Kuo and designed by Corinna Campbell-Sack. Displays include City-owned artifacts, which have never before been on public display, as well as items from the Society’s collection. A sample exhibit panel is displayed below. See what happened in 1867! August 24, 1867, was a day for rejoicing when the first pig iron was cast in Oswego and the dream of freeing Oregon from imported iron started to become a reality. We are very grateful to our generous History Hero donors who each contributed $1,000 or more to the museum fundraising campaign. A permanent plaque prominently displayed in the museum honors these donors. It’s never too late to support the museum by becoming a History Hero. No capes required! We have a winner! Lauren Bruss was the lucky opening day visitor who came closest to correctly guessing the weight of pig iron on display. Her guess was 197.2 pounds and the actual weight is 194.9 pounds so Lauren missed the exact weight by only 2.3 pounds. She won a $100 shopping spree in the museum gift shop! All visitors who sign our guest book will receive an iron company scrip voucher for $1 off any museum gift shop purchase so everyone’s a winner! The Lake Oswego Preservation Society’s History Center & Museum. The 1880s cottage is the last remaining, intact residence from Lake Oswego’s iron era and the last iron company worker’s cottage remaining west of the Rockies. 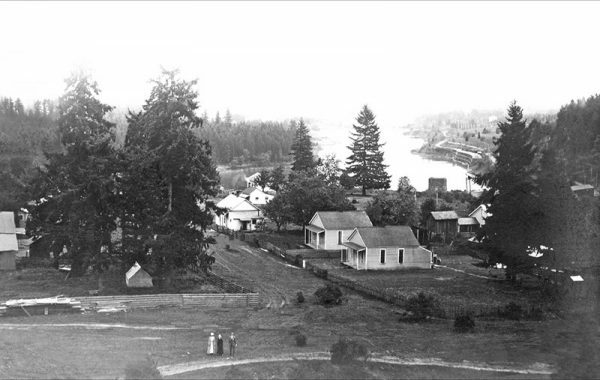 It is on the National Register of Historic Places and the City of Lake Oswego’s Landmark Designation List. It is one of seven sites on the Oswego Iron Heritage Trail. The cottage was built using box construction, a technique used primarily for temporary buildings. There are no studs—planks were nailed to header and footer boards and the structure rests on piers. Inside the front door, a section of the wall has been left visible so visitors can view the construction of interior walls. The Society leases the building from the City of Lake Oswego. We don’t receive any funds from the City to operate this facility. For insurance reasons, the museum is not available as a meeting venue other than for the Society and for official City meetings. Restoration of the cottage was paid for by the hotel-motel tax and grants. No taxpayer dollars were used. The cottage is one of the seven sites on the City’s Oswego Iron Heritage Trail. 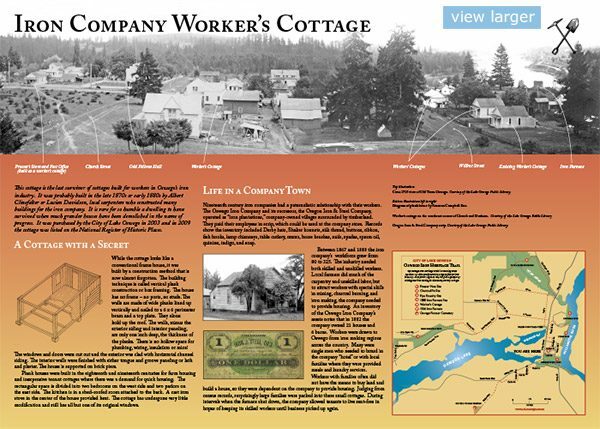 This panel provides more information about the historic Iron Company Worker’s Cottage. Click image for larger view. Collection — The Society has an extensive collection of Lake Oswego historic artifacts and ephemera spanning from the 19th century to the 1960s. We have only digitized a small part of our collection. As we continue to scan and photograph items, we will add them to our forthcoming Collection page. Gift Shop — All items on our Shop page are available in the museum gift shop. Society members receive a 10% discount on items purchased at the museum. This discount is not available online or in any retail outlets that carry our merchandise and it cannot be combined with other discounts. The worker’s cottage in the foreground, the last remaining one west of the Rockies, is now our History Center & Museum. Please let us know if you are interested in becoming a volunteer docent: 503-481-2479. 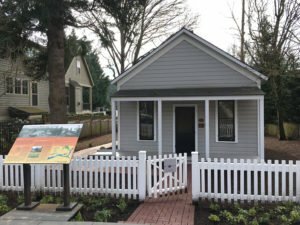 By volunteering at the History Center & Museum, you’ll not only help your fellow residents and visitors learn more about Lake Oswego’s rich and unique history, your service will also strengthen and promote community involvement. The Society is an all-volunteer organization. We understand and appreciate the need to make choices about donating your limited time. Our success depends on volunteers like you who choose to help us make a difference in our community and we are deeply appreciative! Kim Stafford, Oregon’s current Poet Laureate, commemorated the grand opening of the museum on April 8, 2017, with this poem. Copies of it, letterpress printed by Andre Chaves at the Clinker Press, are available in the museum gift shop. This hometown was a mining town, frontier capital of industry, a backwater realm of sweat and clanking steel, where in forest mounds of charcoal great old trees smoked into fuel for smeltering stones dug deep from Iron Mountain. There was that lamplit cave in the warren of tunnels that dragged men into the dark to scrabble ore that strained their tendons carrying buckets of dead weight toward light to be dumped into battered skips for their journey to the furnace. Then the white heat of the furnace tower of basalt, a monument with a mouth that gobbled ore to melt rock into slag and iron flowed channels of sand to cool as pigs snapped loose and stacked for travel—north to Seattle for water pipe, south to structure Frisco’s City Hall. But at last this room, the worker’s curtain could be pulled aside by a hand with its glove of soot—a pitcher of rain, a bowl for becoming human, clean, and then a bed for dreams of hell in the mountain, inferno in the tower, a folded letter from home carried in the pocket of the coat here hung from a peg on the wall. went cold, and the workers’ cottages one by one came down, we were left with stories filled with frenzied beauty, heroes without names, picks prying, fires roaring, and the dreams of workers here, always the humming of dreams.